SharpCatalog  is an easy to use Windows based program which allows you to create professional quality color printouts using low cost printers, catalogs on CDs, flyers and brochures. 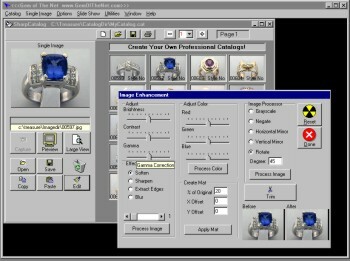 It also allows you to manage your inventory, create slide shows, appraisals and electronic catalogs for the Internet. Do you need an Imaging Solution? Unsatisfied with your current software? Start Using a State of the Art System Today! 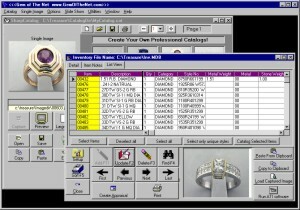 SharpCatalog  was designed from the beginning to adhere to published software standards. The data is stored in Microsoft Access  format so you don’t have to worry about your data becoming obsolete or stranded in an out of date program. You can share the data and images with most Microsoft Office  compatible products. SharpCatalog  keeps a graphical database of your inventory. Information on thousands of items can be retrieved instantly. The following information is stored for each item to search or sort by: Item, Supplier, Style, Description, Notes, Location, Category, Quantity, Date, Gender, Metal Type & Weight, Stone Type & Weight, Menu Category, Cost, Tag Price and the Image. 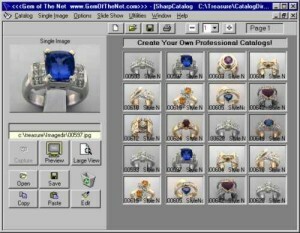 For more advanced needs, the images and databases created by SharpCatalog  are ready to be used on the Internet. You can have a searchable catalog on the Internet, with the ability to take orders from the Internet. Gem of the Net provides this service. In a short period of time have your web site up and running! Web-sites, Mailers, Flyers, Appraisals, Insurance and Inventory. With SharpCatalog  you can preview a live image before you capture right on your computer. An additional monitor or TV is not necessary to position your items before you capture the picture. SharpCatalog was designed from inception to be used on network. You can access your images, and catalogs from anyplace on the network. Multiple users can all share the same Inventory, Images, Catalogs on a network. Install the databases and catalogs on a file server for greater security and easy backups. Please check your spam or junk folders for replies that may endup there.